HAS DEPOSIT! 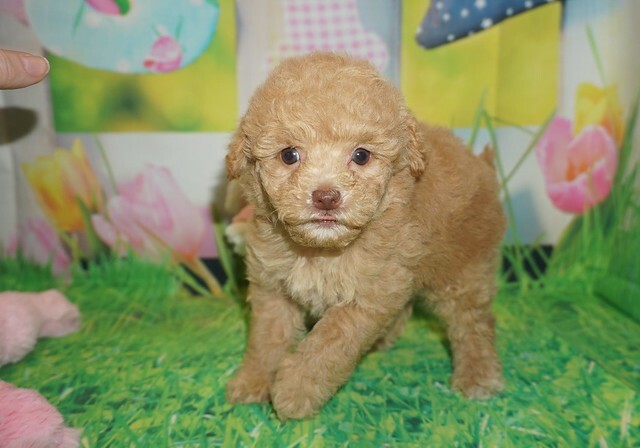 Tramp Gorgeous Apricot Male CKC Maltipoo A Real Sweetheart! Your search has ended. Meet Tramp! He is the true definition of man’s best friend. Tramp loves to play and is ready at any moment to play with you or his toys. Tramp has a very loving disposition and is looking for the perfect family to share that with. Could it be your family? He sure hopes so! Waiting on my new name and my new home is Kingsland, GA.
Hey I’m Tramp I’m one of two boys in my litter of four. My litter name theme is the Disney Movie Lady and the Tramp You can’t go wrong with me as I’m a gorgeous red apricot color with my full tail. You will love my silky hair as it entices you to run your fingers through it. I’m truly perfect in every way. My mom is a first time mommy she is Darla a gorgeous 8 LB Maltipoo my daddy is Chili Pepper a 6.8 lb Poodle making me 75% poodle 25% Maltese so I will be a smart little guy. My adult weight is estimated to be 5-6 lbs Don’t take to long to decide I won’t last long! « HAS DEPOSIT! Scamp Gorgeous Black Male CKC Maltipoo Such A SWEETIE! Hi- I am interested in learning a little more about Tramp. Do you expect his coloring to chafe as he grows? Will he look more like a poodle vs a Maltese? Can you send pics of his mom and dad? His hair could possibly lighten up some as he gets older but we will know better when his hair gets longer in a few weeks and we can look at the roots. I think he will look more Poodle as he has a ruffle in his hair so it will be curly and he is also 75% poodle 25% maltese. I will have my daughter send pictures to you sometime today!